Bob and I were on one of our regular visits to Thickson’s Woods Nature Reserve, in Whitby, Ontario, to check out the development of the Great Horned Owl babies. As we turned to leave, Bob noticed a large woodpecker zipping through the tree tops. 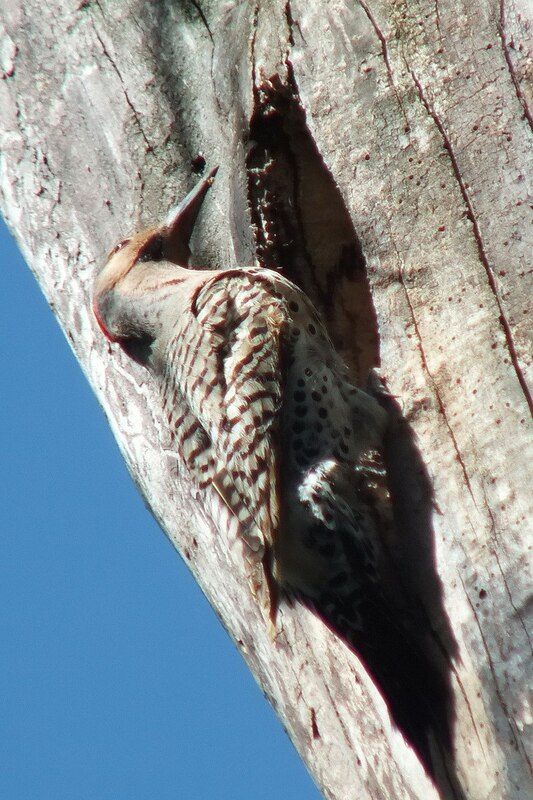 A Northern Flicker landed near the top of a snag. We identified the bird as a male Yellow-shafted Flicker because of the black moustache, whereas a Red-shafted Flicker has a red moustache. 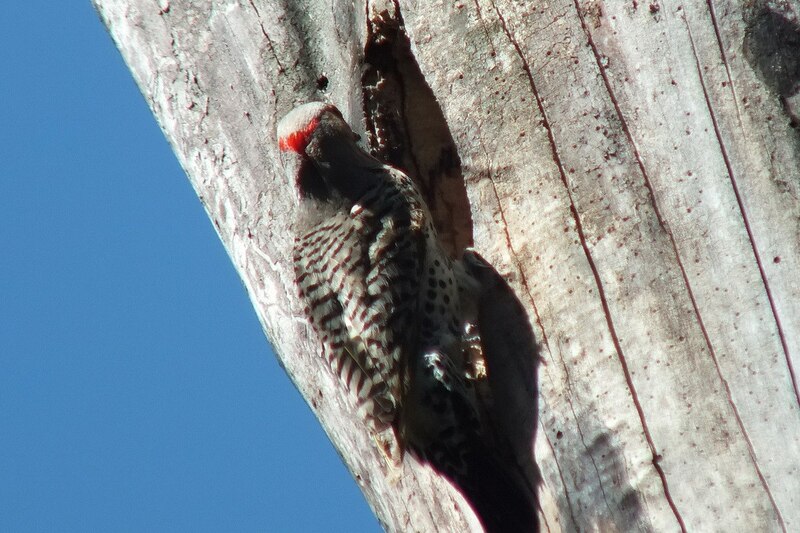 Flickers are woodpeckers that feed on the ground more often than other woodpeckers do. 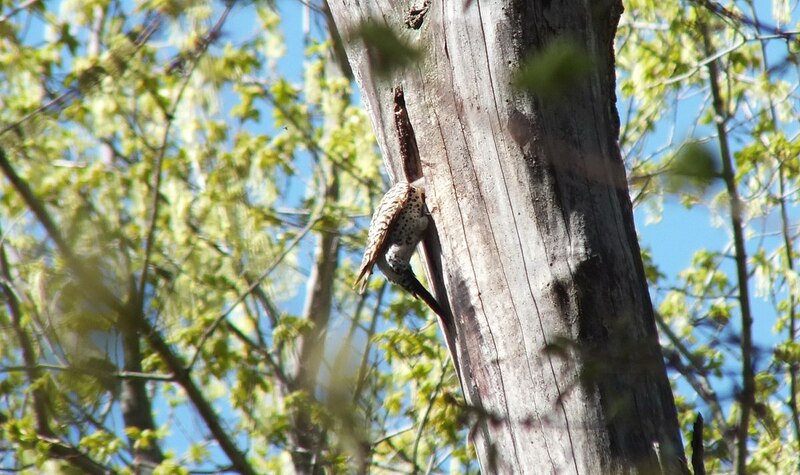 So even though this flicker busied itself at this one particular hole in the tree, we suspected that it was excavating the cavity for a nesting site. 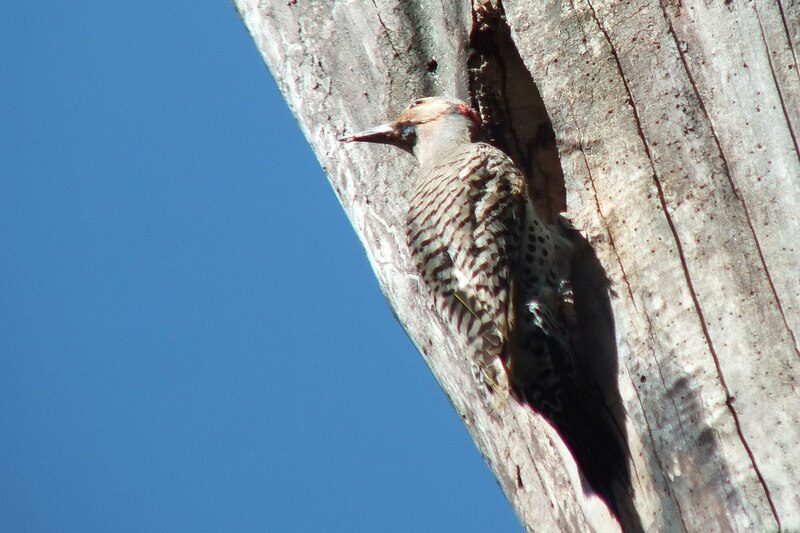 Yellow-shafted Flickers have a bright red crescent across the nape of the neck, and although you can’t see them here, the feathers on the underside of the wings and under the tail are yellow. 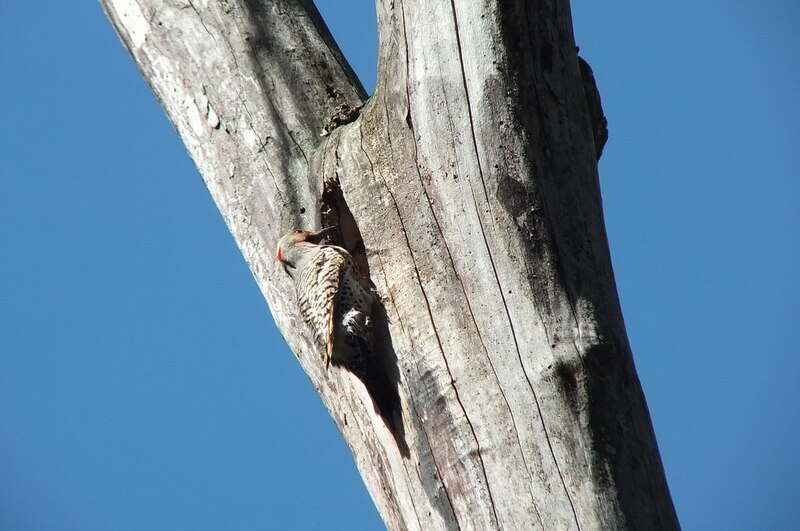 Northern Flickers are one of the few woodpecker species that migrate though only to the southern region of their range. 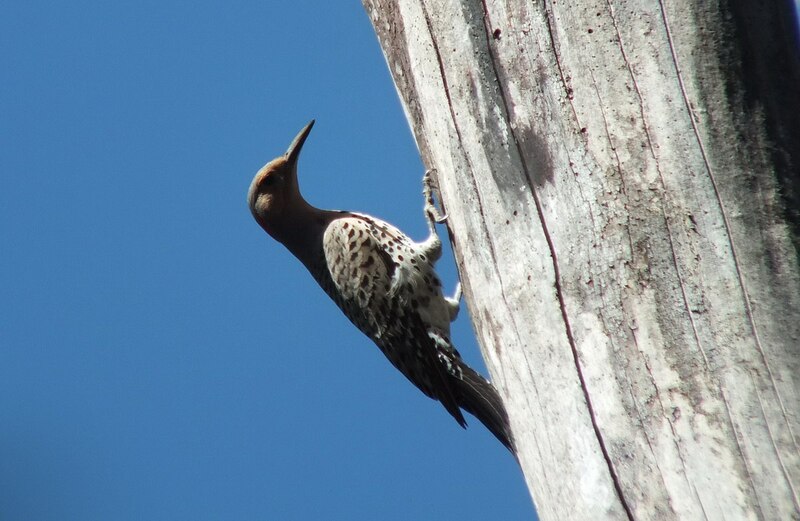 The large white rump patch is most conspicuous when a flicker is in flight. A large black crescent occupies the upper breast, while the lower breast and belly are covered in striking black spots. 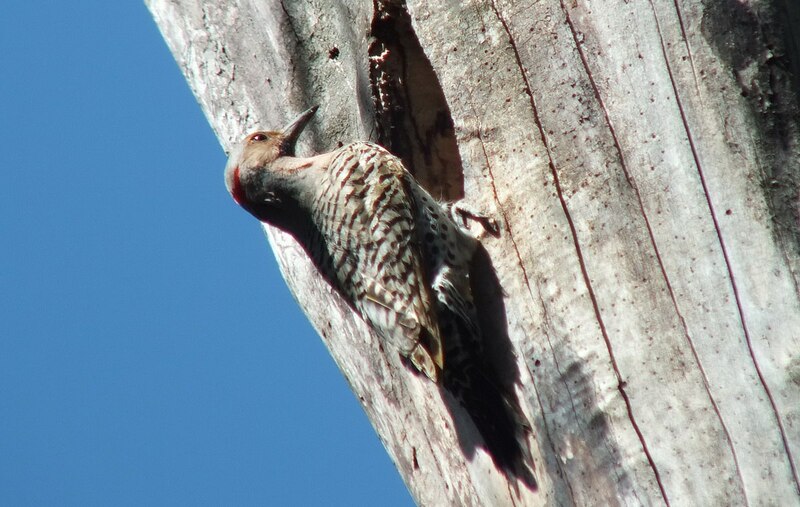 Northern Flickers are large woodpeckers that can achieve a length of 14 inches , making them larger than a robin. Notice how this one uses its tail to gain purchase while holding onto the side of the tree. This wide-ranging and adaptable species inhabits a variety of habitat but prefers moderately open situations including open woodland. 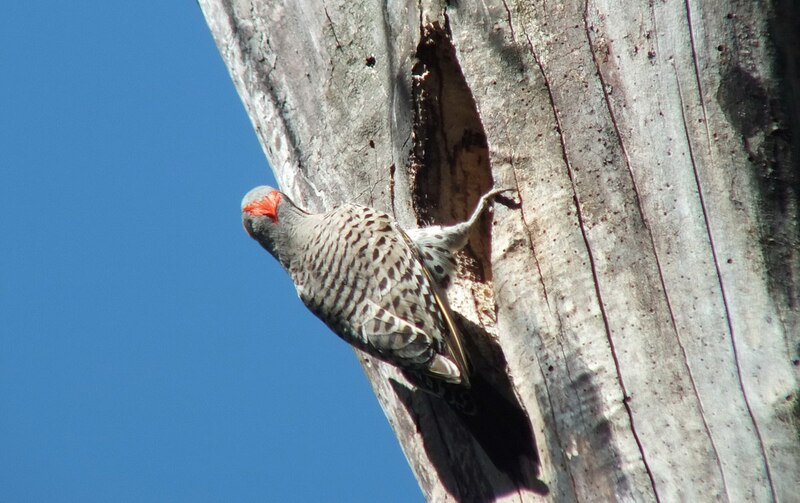 The preferred food of flickers is ants, and they will feed voraciously at ant hills, digging for the ants with their unusual slightly curved bill. They also devour a large variety of other insects that they find on or under the bark of trees. By times, the flicker nearly disappeared into the depths of the nest hole that it was hollowing out. In this photo, the yellow on the underside of the wings is showing. 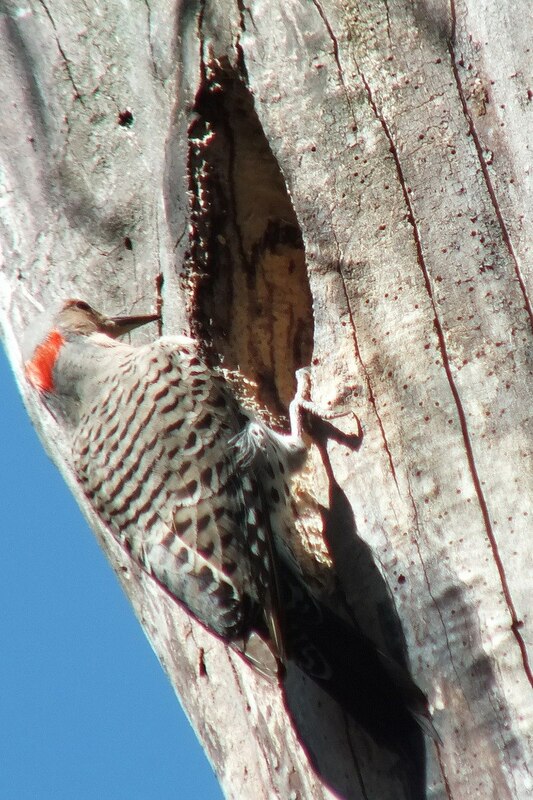 At long last, the flicker took a break from excavating the tree cavity. Instead, it began pounding on the side of the dead tree either for the purposes of communicating with its mate or to declare its territory. After a considerable amount of time elapsed, Bob and I were thrilled to see a second Northern Flicker approach and land on the same snag. I was able to distinguish this one as the female since the black moustache is missing. As the male flew away through the forest, we marveled at the typical undulating flight pattern created by heavy flaps interspersed with glides. 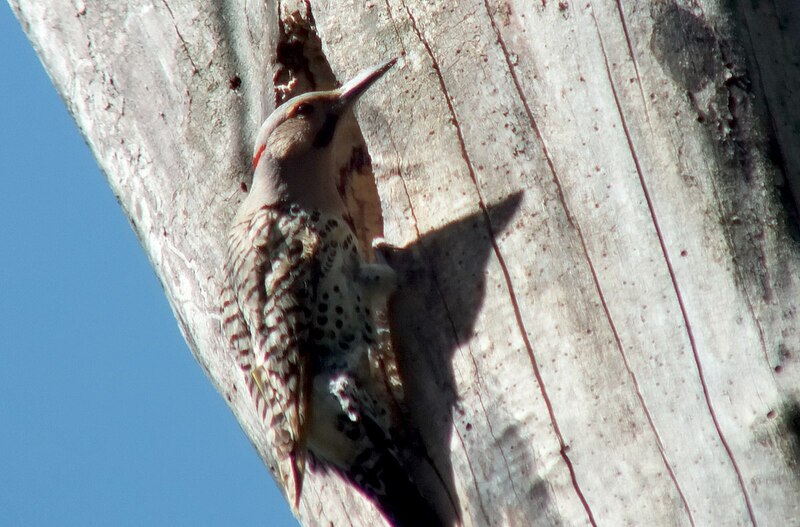 The female flicker immediately took up where her mate left off, continuing to whittle away at the nest cavity. The entrance hole is typically about 3 inches in diameter, and the cavity will be between 13-16 inches deep. It takes about 2 weeks for the pair to build the nest, sharing equally in the task. I missed my opportunity for a picture of the two birds together, but we knew the male would be back to relieve his mate once again. Do you know if there is some kind of house I can build that they will lay eggs and nest? You are very lucky, Robert, to have three resident flickers. 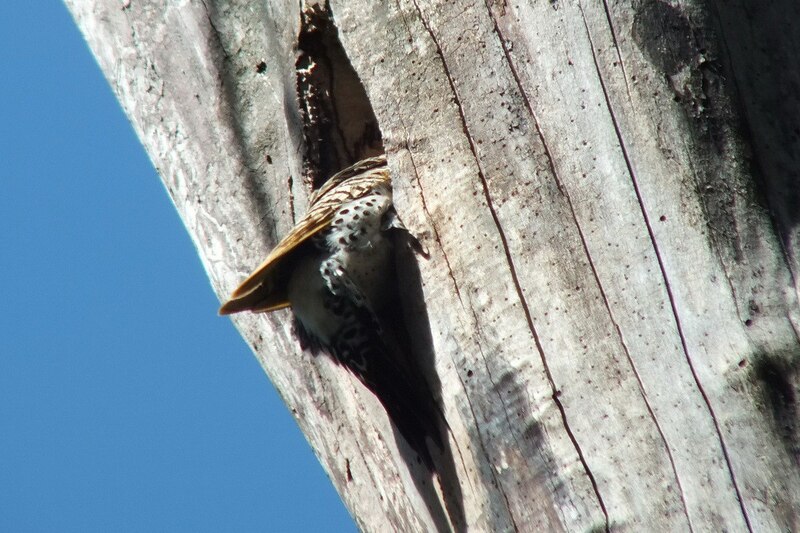 Flickers prefer to excavate their own nests, but if appropriate locations for a nesting hole are not available, they will nest in a Flicker Nest Box. I have attached a couple of website addresses that you may find helpful in that endeavour. You are very lucky. We have had the odd Flicker visit our backyard over the years, and they are regular visitors to my parents’ property. It is always exciting to see them. I hope you score a nice photo. Thanks for checking out our blog. 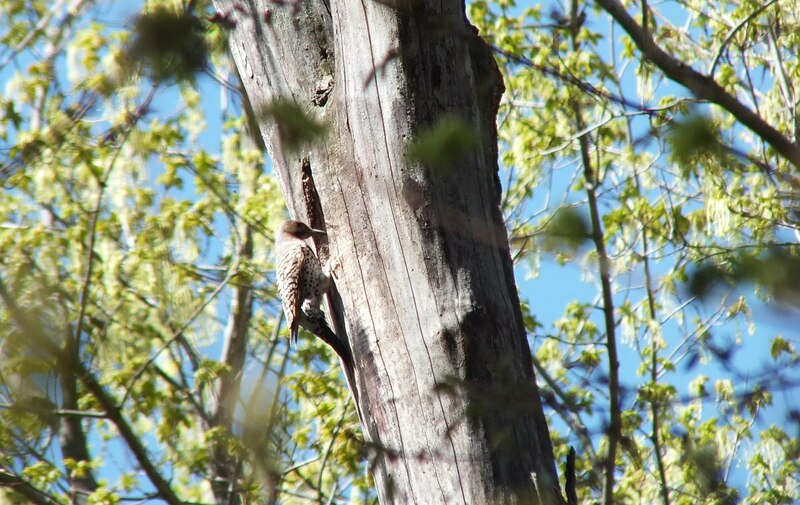 One thing that is essential of the northern flicker, is that the goldeneye will use its nest. Not after the flicker has abandoned it, but while it is still using it. So the flicker does not feel threatened when the goldeneye enters, to lay and incubate its own clutch of eggs. That is the reason why for the small size of the goldeneye duck, so it can enter the nesting cavity of the flicker. Obviously, both species of birds do not carry diseases or parasites that would threaten each other, and the birds feed in two completely different ecosystems. 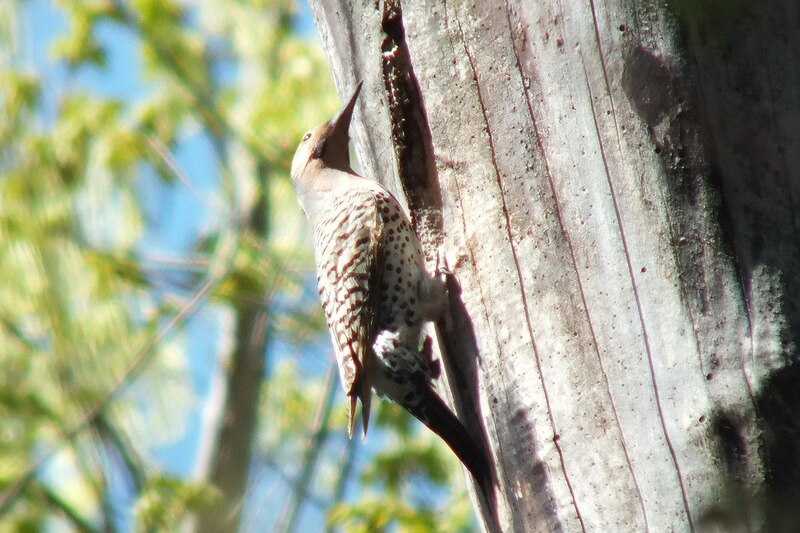 The northern flicker feeds on the ground for ants, and the goldeneye either fresh water or salt water for fish. Thanks for your comments, Tim. I find that interesting.